The festive period is a great time to promote your business to drive sales into the new year. A well planned and executed print marketing campaign can help your business grow its customers base and drive customer loyalty, without breaking the bank. So, while you may not have the budgets of the big brands like John Lewis or Aldi. Your budget can be used effectively to create a print marketing campaign. Aside from the traditional methods of print marketing such as leaflets, brochures and direct mail campaigns. Christmas brings several other opportunities for you to uniquely promote your business. Although there is still a place for traditional methods of print marketing at Christmas, here are a few other ways you could be marketing your business. Sending your customers a personalised and branded Christmas card not only shows you value them, it is also an effective way of putting your business at the top of their minds. This will act as a subtle reminder while it is displayed throughout the festive season. Sending Christmas cards to your customers will help drive customer loyalty into the new year and beyond. It is a great way to help your business stand out from the competition. If you are planning on sending personalised and branded Christmas cards, make sure your design includes your company logo and contact details. This will make it easier for customers to contact you should they wish to do so. Consider including Christmas opening hours or a unique promotional offer to thank them for their custom in 2017. While we are on the topic of promotional offers, sending memorable physical vouchers to your customers not only look professional but can be more trusted than their digital counterparts. 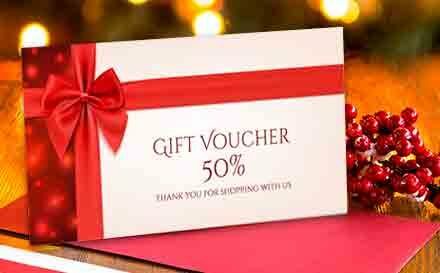 Promotional vouchers can be sent as part of a direct mail campaign, as an insert in your brochure or Christmas card or can even be sent on their own as a little gift to your customers to say thank you for their custom in 2017. Sending vouchers as a gift is a great excuse to communicate with your customers again and will also help your business stand out. Sending your customers a yearly calendar that includes your logo and contact details is not only useful to your customers. It also gives your customers an easy way to contact you. Whether you choose a desk calendar or wall calendar it will be displayed throughout 2018. Keeping your business at the front of your customers minds. Wall calendars with pages for each year of the month can be much more than just a calendar. Consider including important dates within your business or prompt your customers to think about seasonal products or services. A gift guide or festive brochure about your products is a great way to remind your customers about your business and what you offer. Brochure marketing is a cost effective and influential marketing tool, teamed with promotional offers and vouchers, your festive brochure marketing campaign could yield great results. Extending offers into the new year could help drive sales throughout January. Although information about your products maybe on your website. Sometimes you can’t beat the tangibility of a high quality printed brochure.